I've decided that I want to do a new look this year for my Christmas decorations. I've been doing this look for the last couple of years and I still love it but I'm getting a little tired of it. Since everything in my house is grey, cream and silver I think a silver and white Christmas would be really pretty. I have TONS of Christmas decorations that I've accumulated over the years so I won't really have to buy a whole lot to achieve my look but I did go to Hobby Lobby today to get a couple of new items. It made me so excited to decorate but I think I'm going to wait a few more days. While I was at Hobby Lobby I decided to get on Pinterest and search for white and silver Christmas trees for inspiration. When I typed in 'white Christmas tree' I was so surprised to see one of the top photos that popped up was from my blog. I shared a photo of my Mom's gorgeous flocked tree last year and a few days ago I guess someone stumbled upon it and put it on Pinterest. I think it's such a compliment that 1.) someone thought it was pretty enough to pin and 2.) it's been repinned so many times and it's been on there for less than a week. I get excited over little things like that. This is classic Madison and Ivy so I had to take a picture of it today. 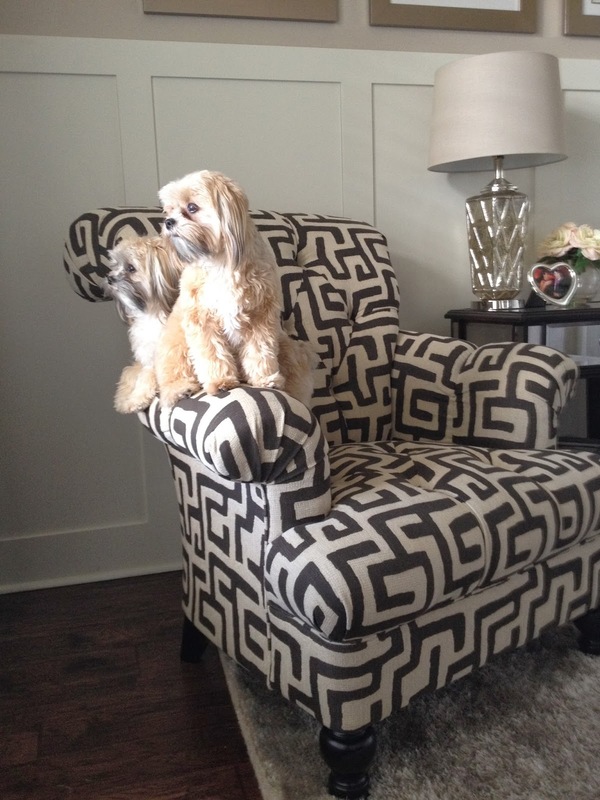 They love sitting on the arm of this chair in the office and look out of the front window. And while we're talking about the little nuggets we had a carpet guy come out today to measure upstairs for new carpet. 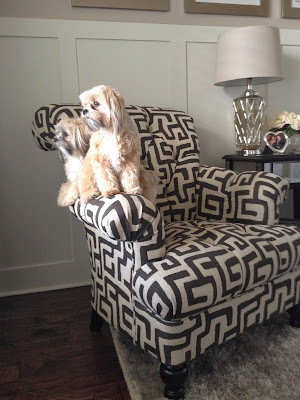 We have to get new carpet because when Ivy and Madison were puppies they went potty all over the place. Isn't that neat. Our house is less than 2 years old and we're getting new carpet. We've had it cleaned twice and I always spot cleaned it myself when I caught the accident but the thought of Campbell crawling over peed on carpet grosses me out so we're getting new. This is where my germaphobe-ness kicks in.